The Idaho Transportation Department seems to feel that it has enough public support to begin evaluating the safety of imposing a 45-mile-per-hour nighttime speed limit on a two-mile section of state Highway 75 immediately north of Hailey. 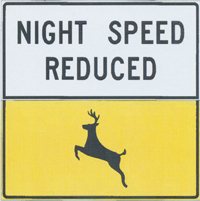 The reduced nighttime speed is intended to reduce the number of vehicle collisions with wildlife, particularly deer and elk. “It’s important that we get some shoes out there to see what’s going on now,” Walter Burnside, ITD project development engineer, said at a Monday meeting of the Wildlife Crossing Committee. Burnside further explained that knowing what speeds are being driven now on the stretch of highway and the number of vehicles now passing through, particularly at night, is essential for a full safety evaluation that would be required before a lower speed limit could be put in place. The Wildlife Crossing Committee serves as an advisory committee to the Blaine County Regional Transportation Committee, which meets about once per month to coordinate transportation issues with ITD and various governmental entities. The Wildlife Crossing Committee voted unanimously in July to recommend the nighttime reduce speed proposal to the Regional Transportation Committee, which will consider the issue at its next meeting on Thursday. Blaine County Sheriff Gene Ramsey has also said he supports the proposal. The reduced nighttime speed limit would affect the two-mile stretch of the highway from McKercher Boulevard in Hailey north to about Zinc Spur Road. Currently the speed limit is 55 miles per hour for most of the two miles. ITD District Traffic Engineer Bruce Christensen reported at the July meeting of the Wildlife Crossing Committee that the area is one of the worst in Blaine County for vehicle and animal collisions. He presented data that showed from 2007 through 2013 there have been 60 accidents along the two-mile stretch of highway and that 32 of them involved vehicle collisions with wildlife. Of those 32 accidents, 23 of them, or 73 percent, occurred at night. Another four accidents, or 12 percent, occurred at either dawn or dusk. Only five of the accidents, or 16 percent, occurred during daylight. At Monday’s meeting, Burnside said the reduced nighttime speed limit is not going to prevent all accidents. “There’s still going to be the same amount of encounters, but driving slower will help avoid collisions,” Burnside said. Committee members discussed several possible changes to the proposal but no new vote was taken to change the original recommendation. “I personally think it should be lower than 45,” said committee member Kaz Thea. Committee member Kris Stoffer said 45 mph seems to be a reasonable speed reduction. “I have been driving 45 in that area all the time I’ve lived in the valley and I have avoided numerous collisions with deer at 45,” Stoffer said. Board member Alan Reynolds noted that the committee will be considering other ideas for reducing collisions. “I think it’s important to emphasize that this is a short-time fix and we’ll be looking at other things,” Reynolds said. Burnside said that once highway construction is finished south of Ketchum, ITD will consider lower speed limits in that area, too. The Wildlife Committee is also studying fencing, wildlife detection systems, establishing better sight lines, wildlife crossing bridges or tunnels, and reconfiguring bridges to make it easier for wildlife to cross the highway at waterways.